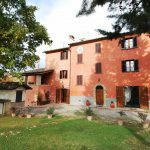 Tuscan farmhouse for sale located near to Monterchi. 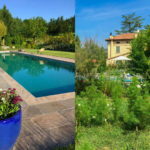 Restored 5 ensuite bedroomed farmhouse with an annexe, swimming pool, olive grove and woodland. The farmhouse is fully furnished, ready to move in. Peaceful and quiet location in the Tuscan countryside. The farmhouse was restored in 2006 and is in good condition, while the annexe needs to be finished. 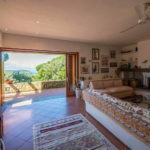 The farmhouse features ceilings with wooden beams and terracotta tiles, terracotta flooring, fireplace and loggia. The property also has an alarm system. Ground floor: eat-in kitchen with all necessary equipment, dining room, sitting room with fireplace, two bedrooms, both with internal bathroom. First floor: small lounge, reachable also from the external loggia, and three bedrooms with internal bathrooms. The house is fully furnished, ready to move in. There is also a small annexe (21 sqm – 226 sqft) in builder’s finish. 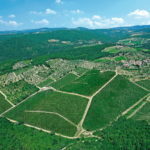 The farmhouse is surrounded by 7.5 hectares of land (or 18.52 acres) with 60 olive trees and woodland. The outdoor pool (6×16 m) reaches a maximum depth of 1.40 m and has a technical room. All the important centres of Renaissance Italy are within easy reach: Florence, Siena, Rome, Arezzo, Cortona, Perugia, Urbino. 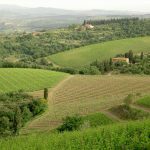 Moreover, the property is in the vicinity of Citerna and Anghiari, two of the most beautiful villages in Italy (Borghi più Belli d’Italia). The Adriatic sea is 140 km away and the Tyrrhenian Sea is 180 km away. 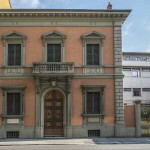 Perugia-Sant’Egidio airport is one hour’s drive away, Firenze Peretola about an hour and a half.